HTC is gearing up to announce its newest flagship device, one that would succeed the highly-acclaimed HTC 10 from last year. We are about two weeks from the announcement date of May 16, and the cat’s out of the bag with today’s leak of the HTC U 11. 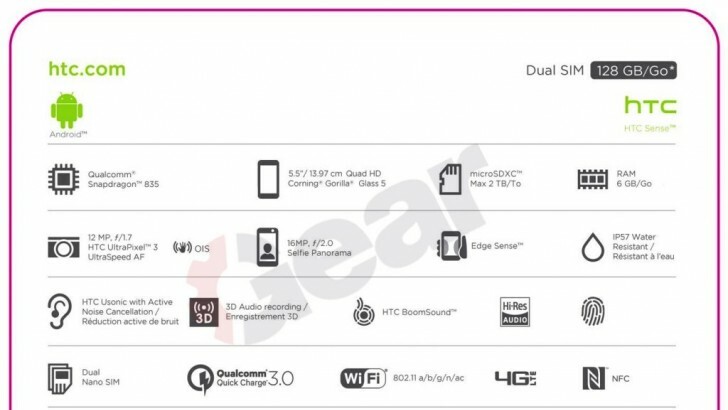 An info-graphic of what looks to be the retail packaging of the HTC U 11 has surfaced, revealing a number of new specifications and features that last week’s GeekBench didn’t expose. Since Samsung was keeping tabs of the Snapdragon 835 chips, HTC had to delay the announcement of its flagship from the usual first quarter announcement. So this is the chip we can expect to see in the U 11. Otherwise, this info-graphic shows information for a dualSIM/128GB + 6GB model. Given that the GeekBench leak we saw exposed 4GB of RAM, we can assume there should be a 64GB+4GB memory model as well. We also see a 5.5-inch QHD display protected by Gorilla Glass 5. The display is the same size as the one on the HTC 10 Evo. Moving onto camera specs, the HTC U 11 will have a 12MP f/1.7 main camera with OIS and HTC’s “UltraPixel 3” and “UltraSpeed AF” brandings. Peculiarly, we’ll see a 16MP front-facing shooter. We expect the HTC U 11 will have an excellent camera. 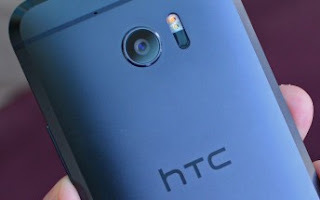 Other features besides the mention of “Edge Sense”, the HTC U 11 will also feature IP57 water resistance. It’s not as high as some other smartphone’s water resistance ratings, but it is “Protected from immersion between 15 centimeters and 1 meter in depth”. There’s no mention of a 3.5mm headphone jack, so HTC has likely not had a change of heart like Motorola seems to have done with the supposed return of the jack on the Moto Z2. Otherwise, NFC, Wi-Fi ac, HTC BoomSound, and HTC’s Usonic headphones with active noise-cancellation will be part of the feature set along with a fingerprint scanner and a Quick Charge-capable 3,000 mAh battery.